You’ll find dozens of uses for these handy drip dry hangers: they’ll hang hand-washables from shower head or rod, keep messages in view on a doorknob, hold recipes at eye-level on cupboard handle, and more! Great on the clothesline. Plastic hanging clothespins come in a set of 6. Sturdy useful item. Great for hanging small items from shower rod or towel rod. Was so happy to be able to obtain them. Use to hang up items that I don't put in the dryer: underwear, bathing suits and sports items that are still wet....terrific. Ordered four packages to give to my daughters. They are very handy for hanging clothes that need dried. I need to buy more! I had one of these from many years ago and every time I travel I say "I need more of these". I finally found these and am so glad to have more at last. They are extremely useful for light daily laundry while traveling. They're kind of flimsy, but they do the job. I'm not sure how long the springs will stay in them without coming apart completely. They are convenient to have. One was broke when I received it. Good for lightweight things. I enjoy using them ! I pack these clothes pin hangars with me when ever I travel. I have always kept several of these hangers. If you have wire racks in pantry you can hang chip or snack bags with these. I used them to hang a shower curtain temporarily to decide if I liked the color. Best product for the money. Use this product to hang up articles that you don't want to put in the dryer. They work great for this use. Added these to basket for new home gifts. She reacted, "these are just what I needed for overnight drying." should have bought this product years ago! I have the product hung above washer,so can hang delicate items that need air dried. So convenient to just take out of washer & hang up. Wonderful product! I use these items in the laundry room to let things drip-dry. My husband loves taking them on bike trips where he can take fewer clothes and hang them up to dry at night. They pack easily. I would definitely recomend them. been looking for these for 30 years!! Mother had similar hangers 30-35 years ago and the plastic is going bad. Thanks to Miles Kimball, you have made a 90 year old woman very happy. She uses them for her nylon stockings and her bras to dry. Thanks again! This is a super product. Easy and commonsensical. I've ordered 6 more. Majorly useful in many, many ways and not just for laundry. I've used one as a recipe holder in the kitchen. A document holder in my office. But they're a little flimsy. One clip slipped off the spring coil, but it was worth putting it back together. These are great little devices. Where have you been Drip Dry Hangers? Family trips for quick wash out items overnight; keeps rubber gloves dry inside by hanging them overnight from cabinet; we leave mail hanging on it on the front door so we won't forget to mail items when we leave the house; great for reminders in places you always go to before leaving the house and/or have a project to do. There are so many things we use them for that I can't recall them all and we find new uses for them daily! GREAT LITTLE PRODUCT! I carry these hangers with me wherever I go, even during hospital stays of family and friends. 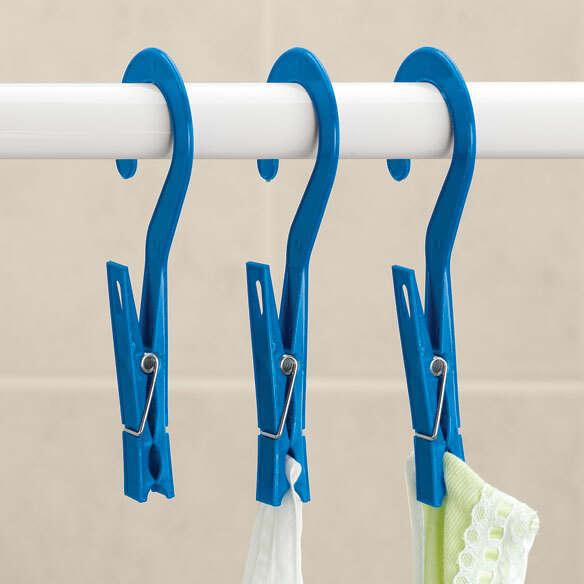 Washing clothes and drying them is so easy with these hanging clips, and they take up much less room than hanging clothing over a rail or shower curtain rod. On a cruise I hung them in the air-conditioning vents in the cabin for a really quick dry! At home hanging personal items on the line or bathroom is much easier with these hangers, too. A great idea! I pack these in every suitcase, and have them in the RV and also some near the laundry. Every traveler needs these ! These "hangers" were a gift for someone who travels alot and he said...they were the best thing he packed. Very very useful !!! i use them to hang my shower cap & wet washcloth in the shower so they can dry. if i have damp laundry to dry i use them to hang the things up. I remember my mom having these, so when I needed to replace a recipe holder these came to mind. I couldn't find them in local stores. I was very pleased to find them on your website. Works great for holding my recipes at eye level and out of the way. I am sure I will find other uses for them as well. I have to drip dry most of my clothes. I use these to hang shorts up by the belt loops. Also good for hanging bras. Had two harder plastic ones for years, but eventually broke and haven't been able to find them anywhere else. Unfortunately, these aren't sturdy enough to hang things off the edge of the ironing board. Would still recommend them, however. Just was I was looking for! I've been looking for these in a number of stores but couldn't find them until now! I like to use them to hang little hand-washables, or my shower cap on the towel rack, etc. Just the right size for what I need. So glad I found them in your catalog! These are to replace damaged clips. I wash things by hand and these hangers are perfect for drying small items overnight. Love these. This is the second set I have ordered. Very useful for many things! Somehow the other review shows 5 stars, I'm actually rating 3 stars. Great for washcloths and hand towels in bathroom, because they dry faster. Eliminates clutter on bathroom rods. Wish they were a little heavier made, but they will work. ''This is a wonderful idea! I have so many uses for these hooks. Aside from the obvious uses I am using one to hang my towel after a shower. My apartment is small with limited storage and I have no towel rack to hang my wet towel on. This does the job and even keeps the towel out of view. My only concern is I wish it was sturdier. I use these when I am traveling abroad and don't want to have a heavy item in my suitcase. These clips are good for hanging up lightweight hand washables. I was excited to find these, and thought they would be very useful--and they are, but the curve on the hanger is narrower than a standard hanger, so I can't use it where I planned on using them. I have been looking for these everywhere. I was so happy to find these. They are very flimsy though and fall apart easily. I wish I could find some that were a little more heavy duty, but I was still glad to find them. Have looked for a long time to replace some I have lost. These are the same but not the heavier quality that my old ones had. Just glad to find something like these, especially for traveling. Would like a better quality, willing to pay more since they are hard to find. The only problem is that the hooks are too small to fit over my (standard) shower rod, which is where I'd use them. They'd be great for hanging kids' art from a clothesline. Great idea, but not strong enough. Won't hold wet clothes, and 1 has come apart already! not nearly as strong as the last ones I ordered! No I wouldn't buy this particular product again. They come apart very easily. I used these to hold a towel in my camper. I had only one towel or washcloth on a hangar. Two broke the first week. These are very poor quality. I have some of these that I have used for years. Would not recommend this product from this company. a waste of money. cheap not worth the space or time. I thought that they would be stronger, but to thin to hang anything on the they broke easely. I had order 3 Sets of 6 each , I only have 12 left out of 18. Could not even hand up a pair of underwear with out then breaking .Each set costing $5.00 Not worth the cost to thin to hand up anything. The product says it fits rods. I have normal shower curtain rods-and they are too small! The clip part is good, though. But I wanted to hang wet garments over the bathtub to dry! Don't waste your money, poorly make as to make them useless!!!!! They don't ever deserve the one star I gave them. Very disappointed in this product. The hangers are made of plastic and the springs don't want to stay on them. The fall apart when you try to open them. I think these are the cheapest things made. I had to duct tape them together to be able to use them. The product is useful but the shipping is to slow so dont be in a hurry for it. I have ordered things from out of the country and it didnt take this long. Cheaply made. Break all the time. I have ECKO drip dry hangers and love them. I was excited to see these offered. I ordered several sets as I like to hang up clothes to save on dryer time. The hangers are very fragile and you can't hang more than a single sock on them. Then you have to be careful when you open them as they fall apart. I have several sets in a pile for one day when I have time to put them together. I wouldn't recommend these to anyone. I've had these before but the quality is no longer the same. Three broke within the 1st use. Another broke by simply picking it up. The spring is worthless! It was a total waste of my money. Plastic too weak and the hook is too small to hang over a shower curtain rod for air drying. These were cheap/ thin and broke with the first use!! These drip dry hangers were made with CHEAP plastic...broke first time...waste of money! Not a value even if you are giving them away. Each has fallen apart when I have tried to use each. Can't put them back together as the spring is too weak. Very fragile. Broke one as I started to use it. If it doesn't fit over a shower rod, it's pretty useless, in my opinion. Great at first, but poor quality plastic gets brittle and breaks - not one or two, but all of them. Waste of money. If you expect these to be anything like the ones your mother used, they aren't! They are so cheaply made that the first one lost the spring as I eased it off the card. The hook on the second snapped off. I'm discarding the other 4. These are very flimsy and would not hold the lightest item to dry. The only reason I'm not returning them is that it would add to the cost of the mistake of buying them in the first place. Too fragile, not as pictured. I dropped one and it broke. Another broke while I was trying to clip an article on it to dry. Poor quality. Feel apart immediately. these hangers are not made very well. When I opened the package one was already apart, hard to put together. In fact the hangers I received do not every resemble the one you have advertised. Will not purchase again. Not a good investment. Several broke. Buying these hangers was like throwing money away. Two broke the first time I used them. Two more broke when I was simply picking them up. I am down to 2 and hold out no hope they will last more than another use. I've never been so frustrated with a product. Total and complete waste of money. I had some similar that lasted a good deal longer and thought I was buying the same ones. I was wrong. the metal clips slide off very easily. Not certain i would buy these again from this manufacturer. Just taking these plastic hangers gently out of the package, one of them broke, the metal spring went flying across the room. Tried to reassemble it, not possible. They are for hanging wet knee highs, lightweight lingerie from rod in shower stall. Disappointed in their poor quality of material and workmanship. I've used these for several years. I want more. I pictured lotsa things these could be used for. I’m still thinking. I have some of these hangers and needed more. It seems like there is always something that needs to be handwashed and air dried, these will help. to wash out things in the bathroom. I have used them for years and my 20 year old ones need to be replaced only because they got a little rusty. .
Never received these !! But I did pay for them. I have been looking for a long time for these drip dry hangers and I finally found them at your store. Helpful aid for the laundry, such as socks to dry. I wish they came in white ! always us these and I only have 4 left. never see them in housewares stores. grab them up quickly. love them. It will be handy to dry small items that don't go into the dryer. Air drying articles not meant to go into the dryer. Can’t find these hangers anywhere! Like them for hanging things to dry in the bathroom. To hand wash cloths up. Wow. I need to hang clothing to dry at times. For an extended vacation, I can wash clothes and dry over bath tub or shower floor. I chose this item because I hang up delicate clothing to air dry, after washing. To hang my special clothes that need to be air dried. easy to hang clothes in the shower -- wash cloths, shower caps and other items that drip. great for hanging small items that I do not want to put in the drier. will 2 hangers hold a wet pair of mens blue jeans? BEST ANSWER: These are light weight hangers. I haven't used them for heavy articles like wet pair of men's jeans. I don't think they are strong enough for that. They break very easily. I doubt if the clip part is strong enough to old the waist-band of men's blue jeans. No, I don't think so. They are sort of flimsy. my experience, this would be no. How many clips will it take to air dry a pair of mens blue jeans? BEST ANSWER: Thank you for your question. Unfortunately this will not work with blue jeans. We hope this information will be of help to you.